This mascara is for lashes that are not too dark. In two weeks you will have lashes that are much darker than you began with*, it darkens bare lashes. 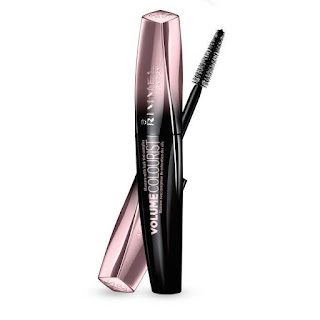 In an instant, lashes appear fuller and longer. The tapered, lash-intensifying brush wraps every lash with blacker than black pigments. It comes in two colors, Black and Extreme Black. I tried it in Black. (*Based on average US consumer perception test, 155 women aged 18-35). It really works. I have lashes that are almost invisible. After using this mascara for two weeks my lashes became darker, not mascara dark but darker so that they could be seen. I still needed to wear mascara though. I appreciate the sentiment behind the product but due to my lashes being so puny and listless, I feel that I need to wear mascara to get the full effect for my eyes. Rimmel London Wonder'Lash Volume Colourist Mascara can be purchased at mass market retailers, such as Target, Walgreens, Meijer, CVS, Rite-Aid and Wal-Mart, nationwide. It retails for around $8.99. Like Rimmel London on Facebook: https://www.facebook.com/RimmelLondonUS; Follow Rimmel London on Twitter: @Rimmellondonus; Subscribe to Rimmel London on YouTube: https://www.youtube.com/user/RimmelLondonUS; Follow Rimmel London on Pinterest: https://www.pinterest.com/rimmellondonus/; Follow Rimmel London on Tumblr: http://rimmellondonus.tumblr.com/ and Follow Rimmel London on Instagram: https://instagram.com/rimmellondonus/.